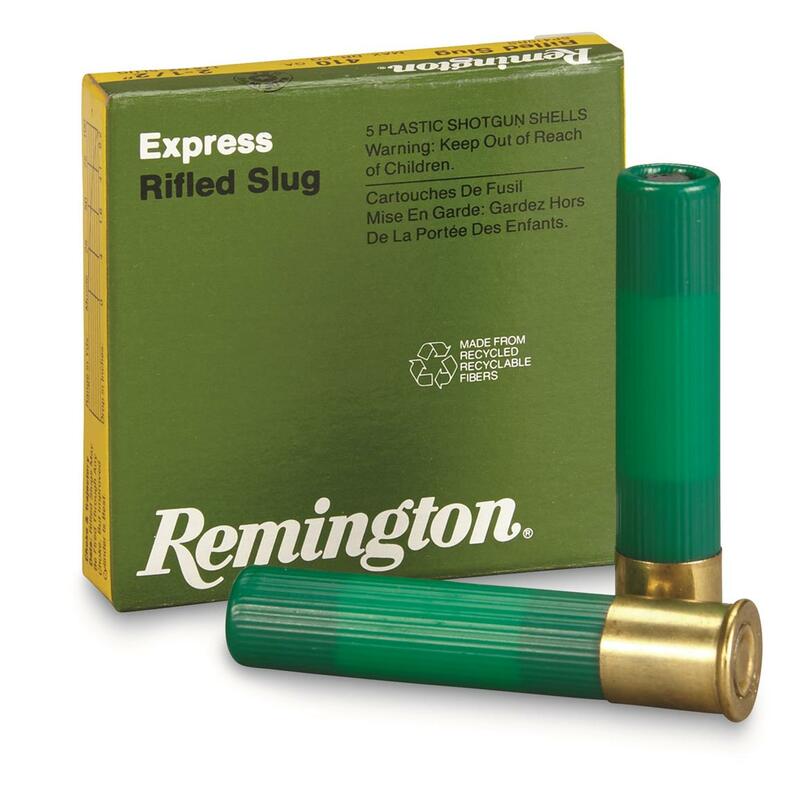 Get top of the line Deer Slug technology and performance from Remington® Express. Remington Express, .410 Gauge, 2 1/2 Shell, 1/5 oz. Slug, 5 Rounds is rated 4.9 out of 5 by 20. Rated 5 out of 5 by GUNNY from FOOT POUNDS OF ENERGY AT MUZZEL PUTS IT IN MAGNUM CLASS WE WERE LOOKING FOR A ROUND THAT WAS NEAR OR BETTER THAT A .357 MAGNUM WITH DROP OF LESS THAN 5 INCHES AT 25 YARDS IN ORDER TO TAKE OUT THE FERAL HOGS THAT ROAM THE COMPOUND AS THEY ARE TOUGH TO KILL ON FIRST SHOT. THESE DO THE JOB! Rated 5 out of 5 by Short shot from Nice Good dilivery, good 410 slugs. Rated 5 out of 5 by Vega82 from Great deal I Used this ammo with my new bond arms and it went bang every time. Rated 5 out of 5 by shar from A Great Bargain These shells are a great bargain - even if we could find them locally. Rated 5 out of 5 by MICHAEL from Way better than expected, a great product! Got a deer 1st shot. And deer dropped immediately. It was my first deer with a 410 shotgun.I Usually use a 243, or 270 for local whitetail. This shell actually gives a me a bigger margin for error for a kill zone and is safer as far as where the bullet lands if you miss or a load passes thru the animal. I recommend it! Highest quality target ammo in the world.